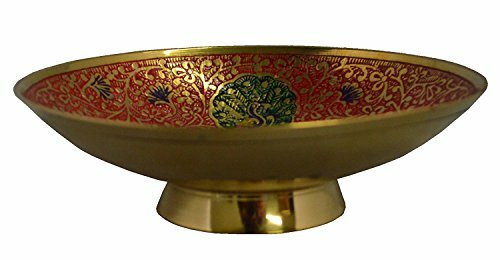 Brass Gold Plated Fruit Bowl.Brass is the finest gift given by our ancestors. Brass is used for multifarious purposes like ornaments, sculptures and even utensils. Brass is opted as utensils as they are firm and unbreakable. In addition, brass utensils like brass bowls do not loose glaze for longer period of time. Bowls made up of brass are fire resistant and heat as well. Also, brass bowls are easily carved and shaped in different patterns. Brass bowls are used for many purposes in our lives. Brass bowls are nicest traditional utensils for keeping edible things. Brass bowls are used for grinding herbs as well. These bowls are very glary and can be used for decorative purposes as well. Brass bowls look very nice and hence are common gifts in the marriage and many other ceremonies. A perfect gift for any occasion like as: Christmas Gift, Festivals, Mother's Day, Father's Day, Anniversary Gift and other Gift Ideas. Care Instruction: Clean With Soft & Dry Cloth. View More In Decorative Bowls. If you have any questions about this product by Zap Impex, contact us by completing and submitting the form below. If you are looking for a specif part number, please include it with your message.